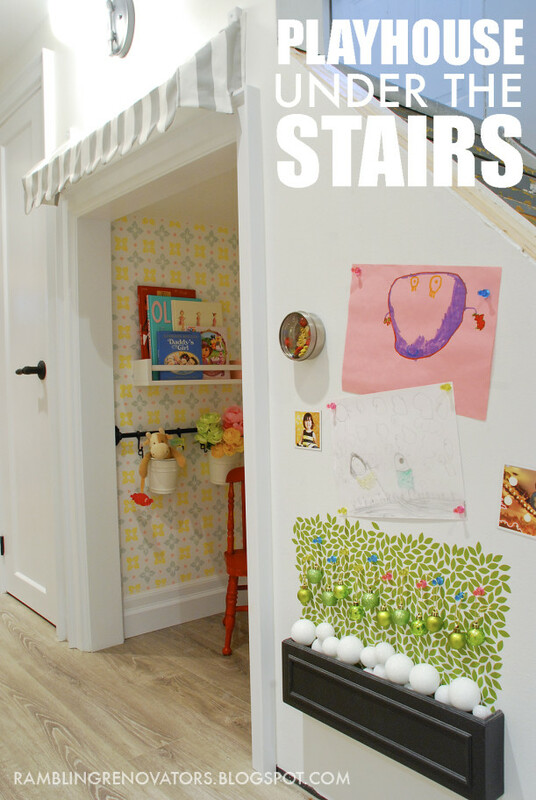 When I saw this adorable little play space and book nook that Jennifer and her husband created for their daughter Chloe under the stairs, I nearly squealed out loud. What young girl (or “older girl,” who might happen to be a mom, for that matter) wouldn’t love having her own little playhouse like this? I’m not sure I would have had the vision to look at that rough space and think, “Playhouse!” But they did. And I love everything about it, from the gray and white-striped awning over the door to the yellow and gray stencil inside. I’d say Chloe is a lucky little girl. Visit Rambling Renovators for all the photos and information about the project! 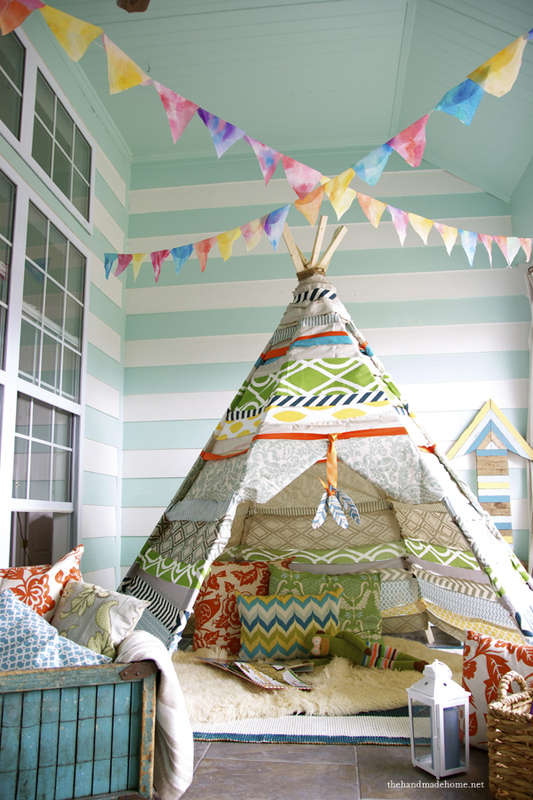 Over-the-Top Kids’ Rooms: Would You Spend This Much? That is the sweetest thing I’ve seen in a long time. 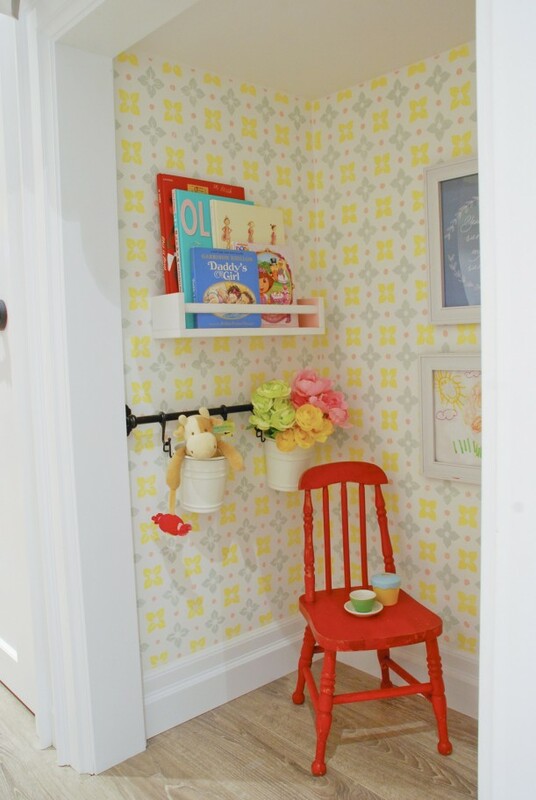 I would have adored a little nook like that when I was a kid, and I’m guessing my daughter would be equally smitten with such a space!! Love it!! So cute!! Under my stairs I have a coat/shoe corner but my kids and their little friends always use it as a hideout/playhouse! 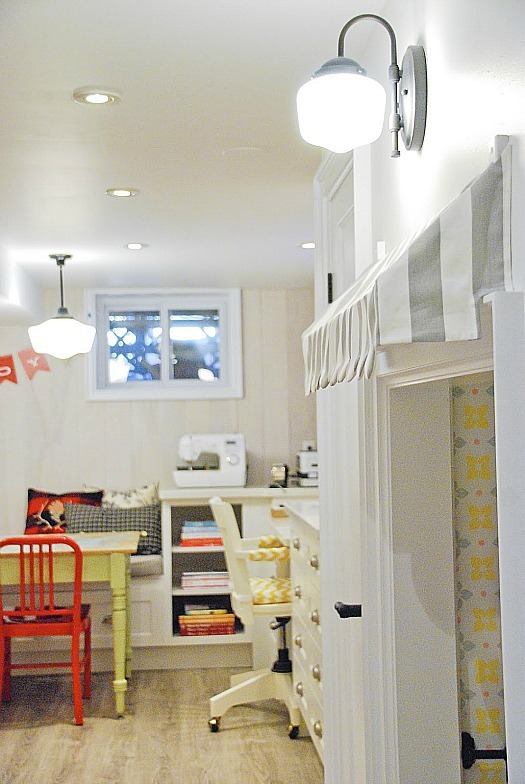 I guess there’s something about a small, cozy space that appeals to kids! Oh, how adorable!!! A-d-o-r-a-b-l-e! I love it!!! I had two of these growing up!!! One outside and one inside that had a “secret door” to the laundry room. Thanks for bringing back the memories for me! Adorable! I want to go sit in there right now! When I was a girl, my dad made me a little playhouse (similar to the one at the end of this post), and I adored it. Thanks so much for featuring our little playhouse Julia! It was a fun space to put together and luckily Chloe loves playing in it too. What a cute and fun place for a girl to play in. If I had one of these in my house, I would spend time in there. 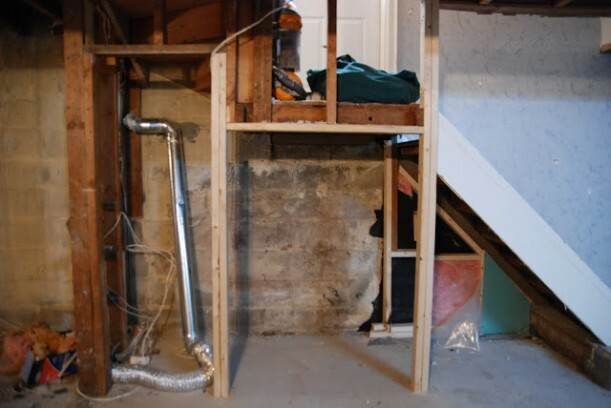 This is one of those extra touches that costs next to nothing when considered as a tiny part of the whole expense of the remodel; however, the dividends are great, measured by wonderful memories. Adorable. I’d have loved it as a kid. The only thing I’d possibly change would be to put a half door on the bottom of the entrance- for impromptu puppet shows or even a removable flower box there with artificial flowers ( instant garden). I guess you can tell that I’d have loved that space as a kid and I’d drag in some blankets and pillows or a little bean bag chair and hang out there all day. I love such cozy spaces. They make me feel snug and safe. It’s another cute feature that is for looks only. Even a toddler would have trouble playing in that tiny space. A triumph of style over substance, too bad for the child. Are we sure it’s not the naughty corner? 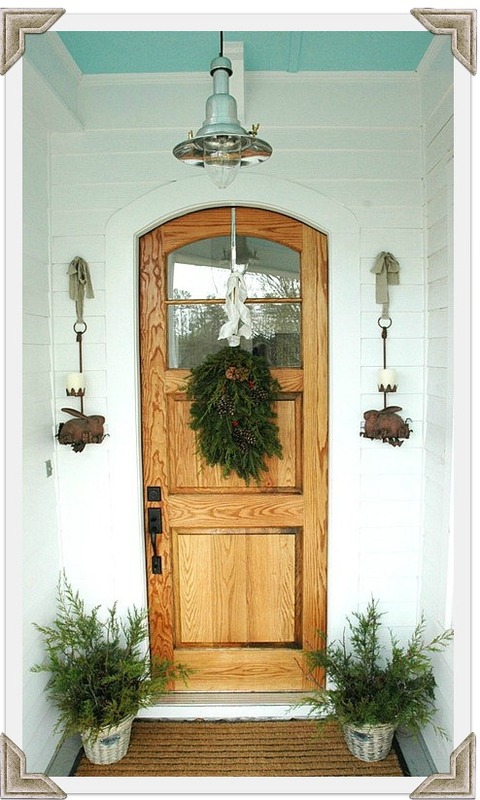 Hooked on Houses was my first House blog and it remains my one and only favorite!! THX for the hard work you must do to put one out everyday!! This is a child’s dream.